Know what that is? That's a great demo dying. I was recently in Amsterdam, at a Microsoft conference called Mobius, and there were a few Zune users in the room. Two of them were Microsoft employees, and we decided to share a few songs wirelessly - or, more accurately, we tried to. No matter how many times I tried, my Zune 80 simply would not connect to either the Zune 8 or the other Zune 80 in the room. At first I thought it was because I was about 20 feet away, but that seemed kind of feeble - I was sure my Zune could reach the other Zunes. And it was certainly seeing the other Zunes ok, so why couldn't it send? I moved to within a few feet and we tried again - nothing. It would see the Zune, and try to start the connection, but always bomb out on the connection phase. 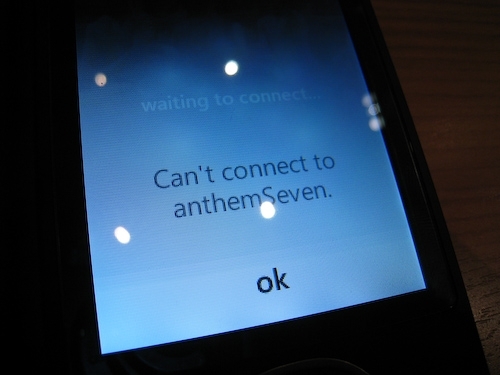 I rebooted my Zune, and still no luck. I tried with the other Zune there (the Zune 8) and no luck. The other two Zunes could send to each other, just not my Zune. I know my Zune isn't defective though because I'm able to send wirelessly at home with my other Zunes. Talk about frustrating! I was also frustrated by my Zune 80 in another scenario: the night before we left to come home, I powered it on to check the battery life. I hadn't used it much at all, so I when I saw that it reported a nearly fully battery, that's what I expected. The next morning we boarded the plane and an hour into the flight I decided I wanted to watch some video podcasts that I had downloaded prior to leaving for Amsterdam. Imagine my surprise when, perhaps 10 minutes into watching the podcasts, my Zune started warning me about the battery level being low. Within minutes, it died - with eight hours left to go on the flight. Thankfully my wife and I had two laptops loaded up with movies to help pass the time. The Zune 8 didn't deliver perfectly either: my wife was using it on the plane to listen to music, and it spontaneously rebooted on her. It only did it once, and I had no explanation for her, but it's never reassuring when any electronic device just decides to reboot. What about you? Have you seen any similarly bizarre issues with your Zune?